You may not feel that an internet-integrated TV is an essential purchase, but for many it’s a high-priority piece of pricey gadgetry in this connected age. These days you’re just not living your tech life to the fullest unless all of your gadgets are tethered to one another, chatting quietly in hushed WiFi and Bluetooth vernacular. Samsung has been cashing in on this fondness for connected home technology with their range of feature-heavy Smart TV’s, holding over 20% of the market all to themselves. If you’re one of the millions of buyers who shelled out for one of Samsung’s units between 2010 and 2013, Kraftwerk 9 Inc. has the perfect companion app to get the most out of it. A smart TV deserves a smart remote, surely, which is where Remotie steps in. 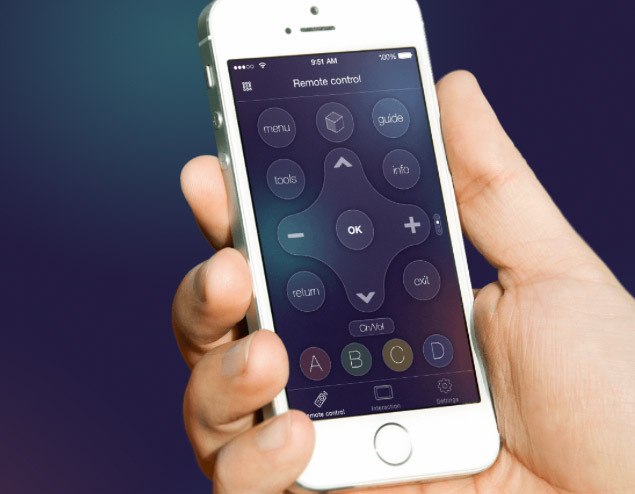 Resplendent in a shiny iOS 7-inspired design style, this niche-market app does just about everything you would hope for from a iDevice-based television controller. A Samsung Smart TV is rather capable piece of equipment, and it takes a remote with a robust feature set to control it all. Internet based programming services, web apps and so on can be a drag to wade through, and this well structured Remotie app makes light work of it. 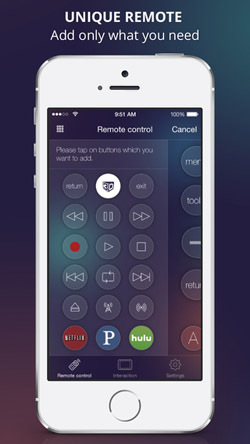 As the iPhone lacks an infrared eye, you can’t turn your TV on with the app, so you’ll need the traditional remote to get started. From there, connecting your iPhone to your TV is a straightforward process – as long as they are on the same WiFi network, the Smart TV is automatically detected. If not, a manual connect option prompts for an IP address. Button layout is sleek and uncluttered, which is impressive considering the wealth of navigational tools at your disposal. The ability to customise the interface makes it easy to add the things you use often, and discard those that you don’t. It’s a little disappointing that you aren’t given complete freedom in this regard, since you can’t alter the layout of the main navigation sections, but it’s forgivable because the core configuration works perfectly well as it is. While the app itself is free, an in-app purchase adds a handy touchpad option for swiping and swooshing your way through the depths of your fancy TV. This, together with the software keyboard and voice-controlled search function, are useful and work seamlessly, but aren’t essential features – which is exactly what we want from in-app purchases. Remotie isn’t the only iOS-based remote app, and it’s not even the only Samsung-specific option available, but Kraftwerk 9 Inc. has put together a product which deserves your attention. Even if you find a competing app which covers all the same bases, the slick design style and intuitive navigation structure makes Remotie hard to beat. It’s only real limitation is that it won’t be able to talk to your massive new 2014-edition Samsung Smart TV, or any other brand either, so keep that in mind before you grab it from the App Store. Remotie requires iOS 7.0 or later. Compatible with iPhone, iPad, and iPod touch. This app is optimized for iPhone 5.